Marie Méon is a French-Japanese chef who grew up in Tokyo, lives in Paris and is the founder of Manger Manger, a company combining cooking, teaching, restaurant design and event-management. 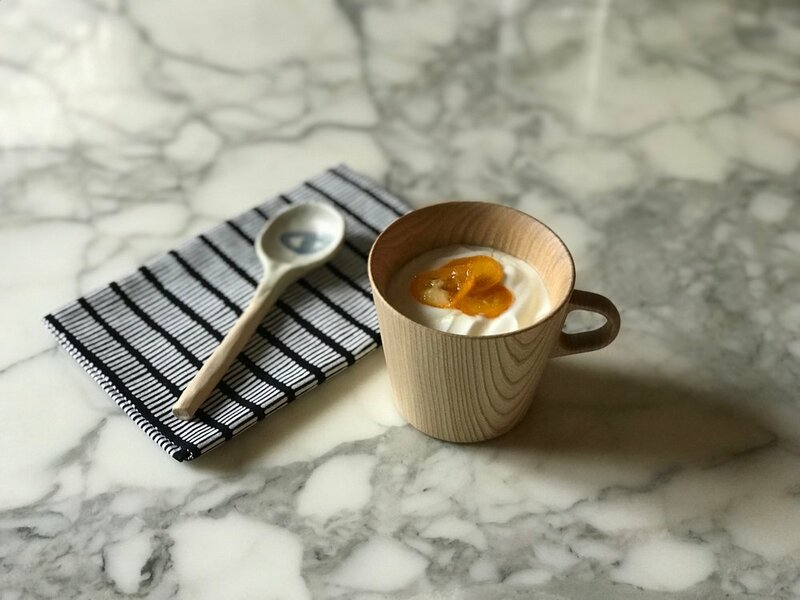 For Inside/Out she designed six seasonal recipes, displayed on artisanal tableware pieces from Japan, selected by Nathalie Agematsu for Shopu. Warm the almond milk on low heat, add matcha powder and whisk. Sear the scallops on a very hot pan, pre-oiled, for 30 seconds on each side. The inside should be pearly in appearance, slightly raw, but warm. Season with salt and pepper, then display the scallops in their shells. Drizzle with olive oil. Whisk the matcha almond milk with a hand blender until it creates a foam. Rapidly collect the foam and pour it on each scallop. Sprinkle the matcha powder with a fine strainer, add a leaf of chervil. Serve immediately. Ps. Matcha almond milk can be consumed as a drink in its own right, hot or cold. Don’t hesitate to recycle any leftovers! China Kiku plate and Soji wooden plate from Shopu. Prepare the tosazu sauce: put the kombu in a pot, fill with water, bring to a boil. When the water starts to simmer, remove the kombu, add the katsuobushi, turn heat off, let brew for 10 minutes, filter and set aside. Add vinegar, soy sauce, salt and refrigerate. Wash and dice the pink radishes with a Japanese mandolin. Slice chives finely. Pre-cut the oysters and open them, dispose of extra water. Display the oysters on a dish, sprinkle with coarse salt, pour some tosazu, and sprinkle with radish petals and chives. Serve without delay. Kunoki Bowl, Yonabe Pot from Shopu. 2 lbs clams or similar shellfish. 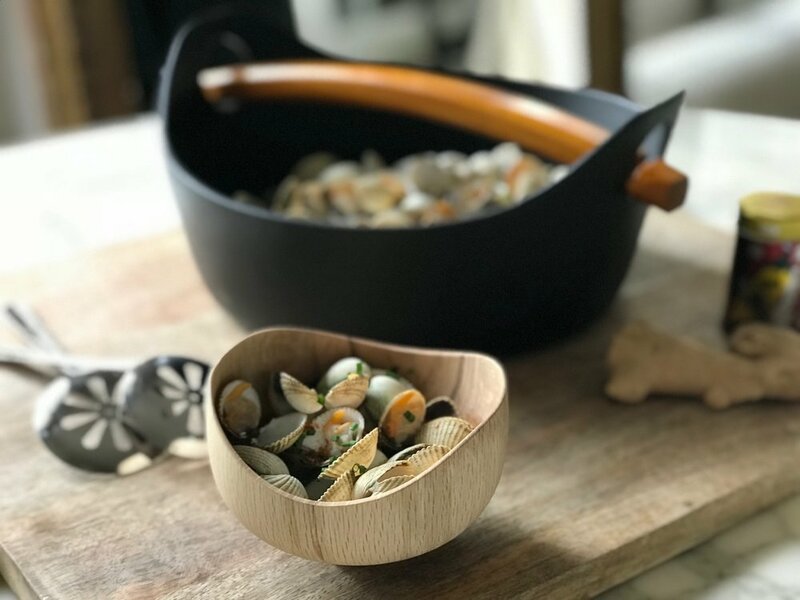 Rinse the shellfish and let soak in a big bowl of salted water. To prepare the dashi, put the kombu in a pot, fill with water, bring to a boil. When the water simmers, remove the kombu, add the katsuobushi, and turn off the heat. Leave to brew for 10 minutes, with the lid on, strain and set aside. (Note: The katsuobushi will sink to the bottom of the pot when ready). Wash chives, slice finely, set aside. Peel ginger, slice finely, set aside. Put the drained shellfish in a preheated casserole. Add saké, salt, sliced ginger and dashi broth. Cover and cook for 3 minutes, until the shells open. Sprinkle with chives, and serve immediately with the broth. Kami Mug and Tenugi napkin from Shopu, Spoon: Madoka Rindal. 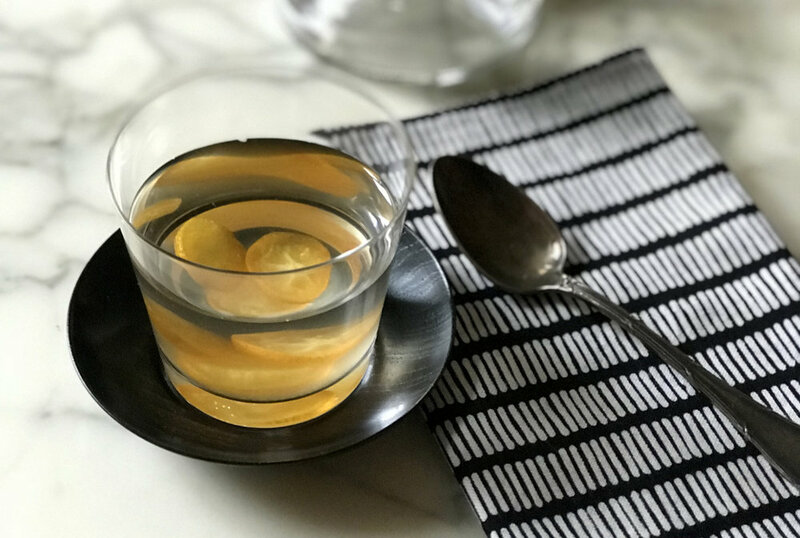 Kumquat syrup is rich in vitamins and can be used as a cough mixture, or for “detox” drinks. Wash the kumquats, slice them finely and remove the seeds. Place the slices in a sterilized dish, pour the honey over the kumquat, sprinkle with the pepper grains. Refrigerate for 24 hours. Enjoy! Muji Glass and Tenugi napkin from Shopu. More recipes by Marie Méon here. Than you: Pauline Wormser & Marie Persyn at Such&Such.